The Korean chilli paste that is used for Bibimbap is called “Gochujang “for less spicy tastes soy sauce may be substituted. Bibimbap is healthy food and to encourage people to enjoy it. I first present the cooked vegetables on a bowl or plate in a colourful eye catching manner. 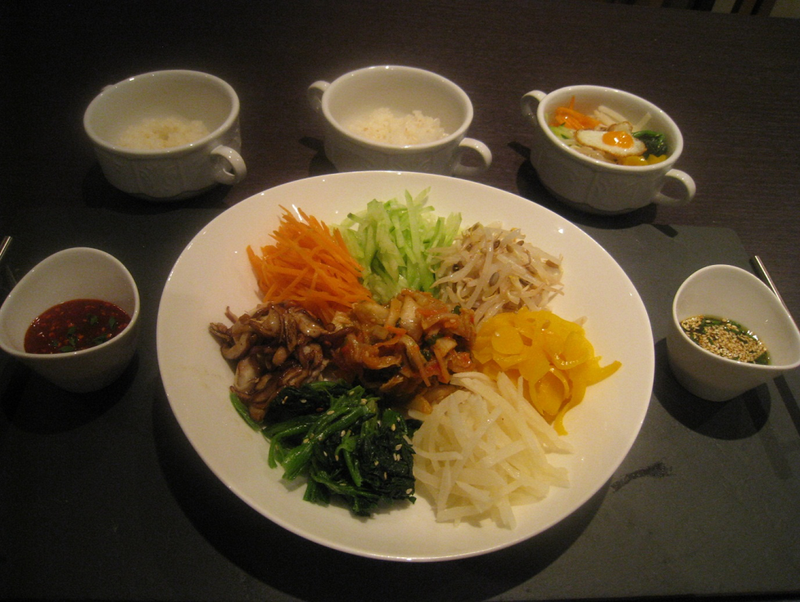 Bibimbap’s ingredients can include these bright colours, so black (shitake-mushroom), white(mooli-radish) , orange (carrots) , green (spinach) and yellow (pepper). You can prepare these (the Namul) ahead or whilst cooking the rice. When I was a child we used to have this dish as a family late night snack when my sisters, my brother and I felt hungry just before going to bed. We would sneak into the kitchen and take out all the left-over vegetable dishes from the refrigerator and mix them all together with warm rice from our rice cooker. We mixed them together in one big bowl and shared it in the dark that without mother knowing. However sometimes my mother was awoken by the clattering of our bowls and steel spoons so she would stop us. My father on the other hand could not resist the temptation of our lovely late night snack so we shared with father and could go bed happily ever after. What was your favourite childhood snack just before going to bed? You need steamed rice you can prepare before or after the vegetables. I made this bibimbap in small portion as you might make a tapas dish so it is served it in a small bowl holding two table spoons of steamed rice then your guests can add their favourite vegetables. To prepare the vegetables, finely slice the cucumber, carrots, moolli (radish), shiitake mushrooms, pepper and kimchi and put them separately. Trim the spinach and cut it in 3-4 cm lengths and then wash. Put the washed spinach into boiling water for a minute and then rinse well in cold water. Squeeze the spinach to remove the water and add a pinch of salt, white pepper, sesame seeds, sesame oil and grated garlic. Mix together lightly and put it on your big serving plate. Put the trimmed and washed bean sprouts into boiling water for 2-3 minutes. Drain them in a sieve and leave them for 3-5 minutes before mixing lightly with a pinch of salt, white pepper, sesame seeds, sesame oil and grated garlic. Then add the bean sprouts to the serving plate. Whilst waiting for the beansprouts, stir fry the shiitake mushrooms for a minute with a pinch of white pepper, sesame seeds, sesame oil and grated garlic than lay the mushrooms next to the spinach. Stir fry the carrots for 50 seconds with a pinch of white pepper, sesame seeds, sesame oil and grated garlic and lay them alongside the spinach and the shiitake mushrooms. Next add the sliced cucumbers and the cooling bean sprouts to the plate. Stir fry the peppers for 50 seconds with a pinch of white pepper, sesame seeds, sesame oil and grated garlic and lay on the plate. Stir fry the mooli (radish) for 50 seconds with a pinch of white pepper, olive oil and add them alongside the peppers. I used olive oil this time rather than sesame oil to keep it white in colour. Put the chopped kimchi in the middle of the big serving plate. Finally I chose to pan fry the quail eggs but keep the yolk runny. The guests can put it on the top of their vegetables if they desire and the runny yolk will mix with the rice. There are two types of traditional sauce. One option is a mix of Korean chilli paste, toasted sesame oil, honey, soy sauce, toasted sesame seeds, black pepper, garlic and chopped chives. An alternative is soy sauce mixed with sesame oil, honey, toasted sesame seeds, black pepper, garlic and chives. After adding your favourite vegetables to the rice, take your choice of sauce, sprinkle a tiny bit of sesame oil and a few sesame seeds and mix all well together, then Enjoy!